Chaat is a word synonym to Delhi cuisine! The capital is famous for mouthwatering spicy chaat.. Aloo Chaat, Fruit Chaat, Bhalla Papadi, you name it and you have it out there! Here are some places you can’t miss out on in this lifetime! This place is on the tip of the tongue of every Delhiite when asked for a suggestion for a chaat place! The place is located in the middle of Gulab Bagh and Ashok Vihar. If you’re patient even to wait for your turn at each visit, this place is a must go! If you’re someone who dreads the narrow crowded lanes of Chandni Chowk, then this is your place. Located in an upmarket place, they are a hygiene conscious outlet that uses only mineral water for all preparations. They have some vivid specialities on the menu like Banana Chaat, Aloo Tikki, Bhalla Papari and Spinach Chaat. They also have a good variety of paans like Strawberry, Butterscotch and Chocolate! Swearing by their brand name, they cannot just afford to disappoint you. 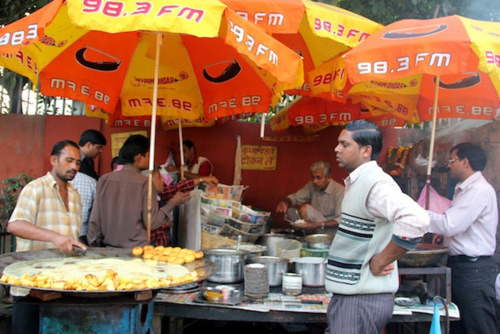 It is one of the most sought after chaat places in Delhi. They serve not just the best chaat but also the best Indian sweets in town. They steal the show with the best of Chole Bhature, Raj Kachori and Dahi Bhalla. Haldiram’s street food initiative is one of the best of its kind. Having been on Chaat grounds for the last 28 years, their melt in the mouth dishes are sure to floor you. The stall which is nicknamed UPSC Chaat Wala is also renowned for Kulfi Falooda, which is a rare find except for Girgaum Chowpati in Mumbai. Their mint and tamarind chutneys are to die for. Frequenty visited by both locales and tourists, the place serves up one of Delhi’s best aloo tikkis. Their papdi chaat is a must munch as its topped with oodles of spicy chutney and tangy yogurt. This Chandni Chowk joint has a traditional flavor to it. It is old, it is unique and it is inexpensive. It’s said that they serve chaat like none other in Delhi. So you cannot afford to miss this one! Reading this will have surely made your mouth water! So why wait?